Shaving happens…on the legs, pits, face. It is a part of life for a lot of us, but it’s not always our favorite activity. Those memes that depict hairy rabbit legs revealed, proclaiming how glad we are that it’s winter and we don’t need to shave? Yeah, that’s how I like to roll. My daughter on the other hand, shaves regularly. Apparently, she doesn’t like to be compared to a Sasquatch when her legs show. Who knew such a perspective could be instilled by a mother who feels quite differently, right? My 17 year old son also shaves. Not his legs, mind you, but his face. That little baby face with the peach fuzz. I guess his girlfriend “makes” him do it. Or he is going for the professional look. For whatever reason, he shaves at least once daily. Cutting yourself while shaving is inevitable. For many of us, including my kids, it happens a lot. It’s painful too, especially when the cut is behind the legs or under the arms. Places you can’t see very well while you shave. Dull razors can also cause those nicks and scrapes to happen. When cuts from shaving happen, the last thing you want to deal with is the tiny bits of paper sticking to your skin to stop the bleeding. Also, having an open cut means exposure to bacteria. You know, those tender areas like the arm pits or behind the knees where dirt and sweat tend to accumulate. What can you do? You can make these DIY styptic pencil melts. 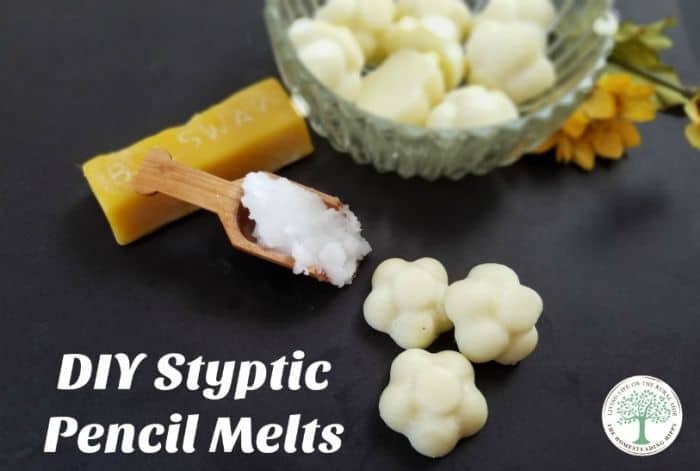 The ingredients in these DIY styptic pencil melts are all natural, and you may have them already on your herbal shelf. Yarrow (Achillea millefolium L.) is great for helping to stop bleeding. It also is a great anti-inflammatory, helping to protect skin when it has been cut. Coconut oil has anti-bacterial properties to help ward off infection. It’s also great for infusing herbs. Beeswax helps hold the mixture together. This ingredient is known for it’s soothing properties! This is a great DIY project for a rainy day, and one batch can easily last 2-3 months. Unless your 12 year old wants to try his hand at shaving with his sister’s razor. But, that’s another blog post. First, preheat the oven to 200. Add the coconut oil and yarrow flowers to the bowl and place in the oven. Allow the coconut oil to infuse for 2 hours. Strain the plant matter and toss in the garbage. Add the beeswax to the infused oil and place back in the oven to melt. Pour carefully into your molds and allow to cool overnight. Store in the fridge to keep them from melting before use. To use, simply apply to cleaned skin when cuts happen. Do this by rubbing a pencil melt over the skin gently, allowing the body heat to melt it. Allow to absorb into the skin. What do you do for minor cuts like from shaving? Will you try these DIY Styptic Pencil Melts? Be sure to pin this for later!